Displays intense feelings for familiar faces, focuses anger on people or objects, shows pleasure in mastery, asserts self, indicating a strong sense of self, shows considerable interest in others. Holds bottle, sits up, moves freely about the room either by crawling or walking, rolls a ball, walks up stairs with help, tries to kick a ball, feeds self finger foods. Knows own name, recognizes self in mirror, explores everything, uses one word sentences, understands more words than can say, copies a few simple actions or sounds. Displays feelings and behaviors, begins to exercise self-control, begins to recite rhymes or songs with peers, begins to recognize the rights and feelings of others, enjoys small group activities, calls self and others by name. Climbs, descends stairs one foot at a time, can sort shapes, scribbles with crayons/marker, jumps off of one step, kicks ball, tip toes, stacks four or more objects, can don simple garments, scoots on tricycles. Role plays life experiences, vocabulary up to 100 words, defines uses of common items, listens to short stories, can differentiate familiar objects by touch, demonstrates individuality, helps dress and undress self. Verbalizes, aware of own feelings and those of others, begins to cooperate with others, recognizes the rights of others, identifies a missing peer by name. Walks up and down stairs, balances on one foot, begins to hold crayons correctly, throws, kicks, and rolls a ball, can build tower 6-8 blocks high, puts on own coat and zips zippers (with assistance), toilet learning as ready. Recounts daily events, begins to play pretend games, vocabulary up to 200 words, uses complete sentences, listens to and retells simple stories, songs and rhymes, asserts independence, classifies, labels and sorts objects by groups, identifies 6 or more body parts. Understands taking turns, likes to “help” when asked, volunteers to help, participates in one to one communications, expresses feelings verbally, acts with increasing independence, stands up for self, exercises self-control. Builds towers 8-10 blocks high, completes 7-10 piece puzzles, rolls ball toward target, attends to own toileting, puts on own coat, alternates feet when climbing or descending stairs, handles scissors, learns to pedal and pump. Listens to and can dramatize stories, can sequence stories, retells stories, recites rhymes or songs with peers, recognizes printed first name, begins to write some letters of name, compares and sorts objects by color, shape, size, etc. Develops self-control, cooperates, helps, negotiates, compromises, solves interpersonal problems, knows name (full), birthday, address, and phone number. 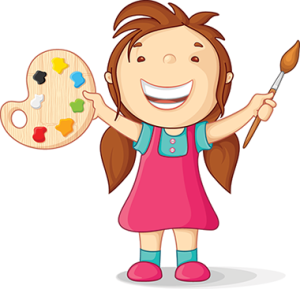 Runs, jumps, pedals and pumps, balances, expresses self freely and loudly in out-of-doors, models clay, fingerpaints, paints at easel, buttons small buttons, walks backward on balance beam, begins to write letters. Listens to and “reads” stories and poems, begins to write name, participates in dramatic play, talks freely with others, observes and describes environmental changes.